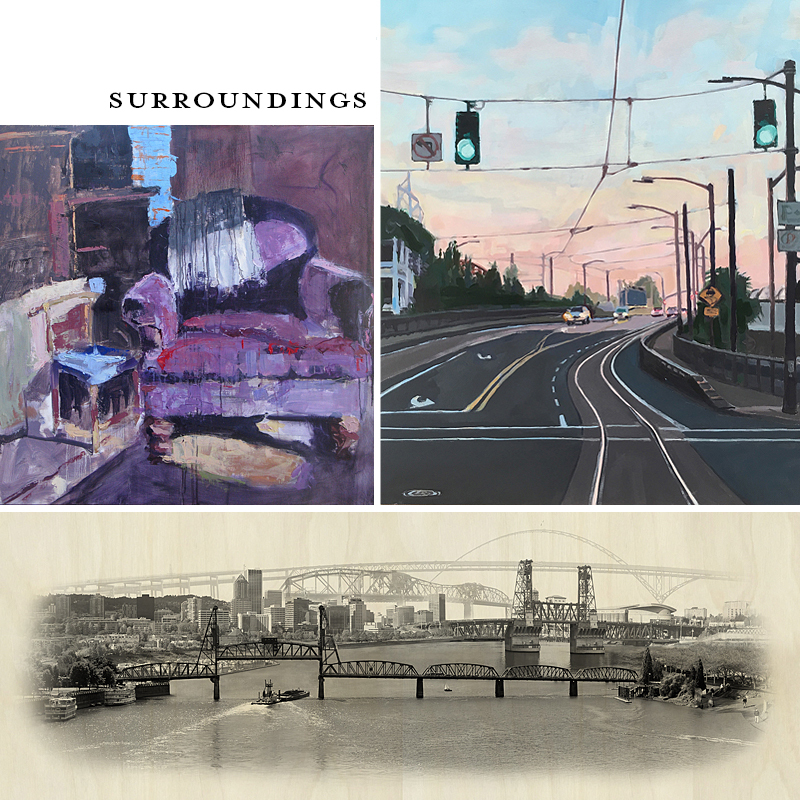 “Surroundings” will be a three person exhibit of oil paintings and prints exploring Portland through different perspectives. 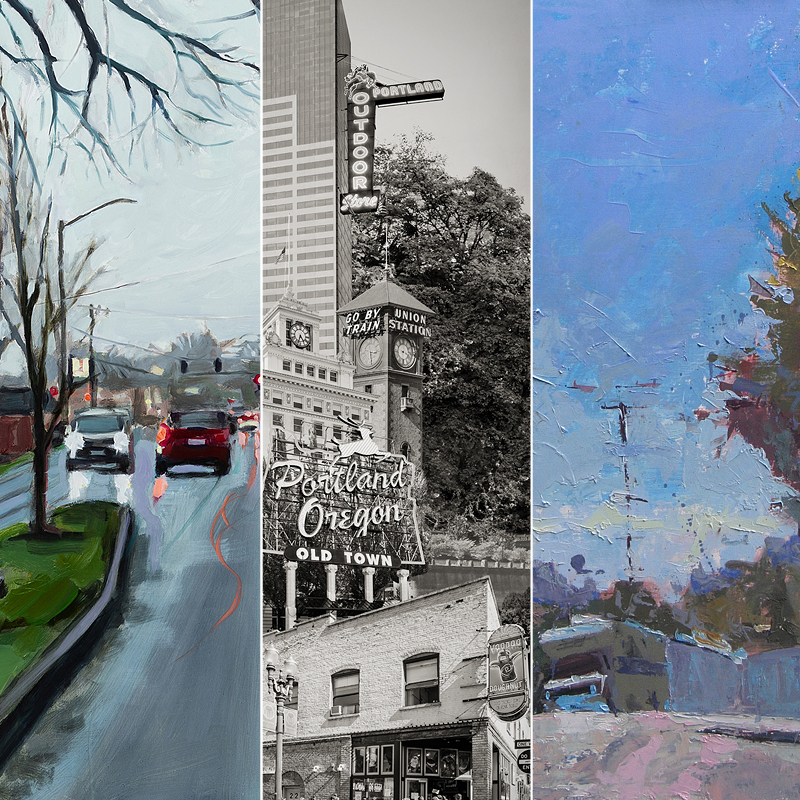 Shawn Demarest, Bill Sharp and myself are long-time Portland residents whose work is concerned with observing and portraying local surroundings. Each of us provide a strong sense of place of our surroundings from a cityscape perspective, to the street-level feeling the rain on our feet, down to the comfortable feeling of sitting and contemplating our own front yard or living-room. Shawn Demarest leverages photography to guide her paintings, but once on canvas, builds her own interpretation, memories, and impression of the scene by using layers and layers of oil paint and glazes to provide heightened awareness and impression of a moment in time in the city. Bill Sharp spends time drawing and painting on site, grasping more intimate, and personal moments in daily life – then, in the studio references the sketches to make works that grasp the experience of place with more immediacy. And my work, as always, will demonstrate a unique vision of cityscape illustration using original photography, photomontage, and highly specialized printing techniques. My themes are concerned with the juxtaposition of images and landmarks to create a sense of place, reflecting on our urban life and culture.